Robin Rue Simmons speaks at a forum she attended on Jan. 19 with the other candidates for 5th Ward alderman, mayor and city clerk. Simmons received most votes in the primary on Tuesday. Robin Rue Simmons and Carolyn Murray will be moving on to the general election in April for the 5th Ward aldermanic race. Simmons and Murray received the highest number of votes in the primary, carrying just over 50 percent and 21 percent of the vote respectively. Carlis Sutton, who received over 15 percent of the vote; Misty Witenberg, who earned just under 10 percent; and Daniel Featherson, who carried under 4 percent of the vote, will not be moving on to the general. Both Simmons and Murray have focused their campaigns on affordable housing support, a widely-discussed issue in the ward. Simmons told The Daily in January she would work to increase jobs and support for small businesses in the ward, as well as redistribute funds for affordable housing support to increase homeownership. 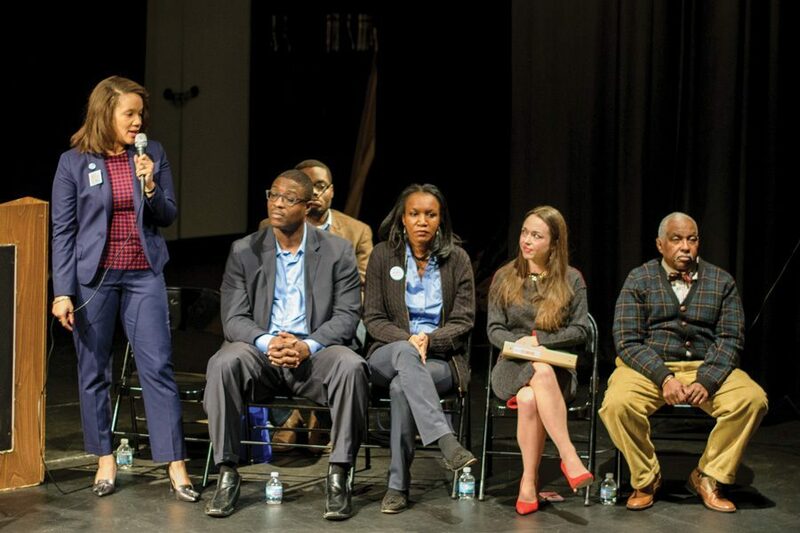 Murray told The Daily in January that her campaign is focused on building a unified platform to address concerns across the ward, including the availability of affordable housing and effective community policing. “There is such diversity in the types of demographics and their concerns, but they all live together, so you want to develop a platform that … addresses everyone,” Murray said. Both Simmons and Murray were not available for comment Tuesday evening. In a statement sent out to residents of the ward, the current 5th Ward alderman, Delores Holmes, endorsed Simmons for the position. Witenberg, who conceded her race Tuesday night, told The Daily she will be supporting Murray. Looking back on her own candidacy, Witenberg said she was “disappointed” with the outcome. Featherson similarly expressed his disappointment with the outcome and turnout at the polls, saying he hopes to be involved in city committees in the future. He has not yet decided who to endorse. Carlis Sutton could not be reached for comment. Mayor Elizabeth Tisdahl has endorsed Simmons for the position, citing her work with Sunshine Enterprises and job creation. “Robin has a done a good bit of work on jobs also, so I think she will be an excellent person to have as an alderperson,” Tisdahl told The Daily. Murray and Simmons will be heading to the general election on April 4. Nora Shelly and David Fishman contributed reporting.